A gnome is a mythical creature found in many different story tales. 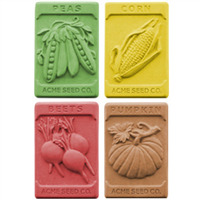 The Gnome Soap Mold features a gnome with a cute cap, a large fluffy beard and a wide belt with a rectangular buckle. He could also pass as an elf for holiday soaps. 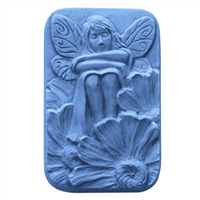 Bar Depth: 1 1/8" Bar Length: 4 1/8"
COMMENTS: I use this mold for one of my springtime milk soaps, and it comes out adorable! 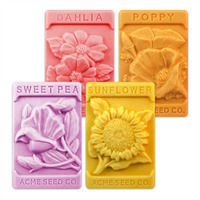 The design is there, and I have really no issues getting the soap out at all (which is great!). COMMENTS: I think this is a super cute mold. You can make out the details using a single color of soap. Unfortunately customers don't seem to agree with me, because I haven't sold a single soap despite many craft fairs. Maybe this soap will go over better in the summer months. "Would this be able to be used for wax to make crayons?" Staff Answer Yes it can. 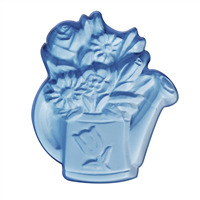 The maximum temperature for these plastic molds is 135° so you would need to be sure the wax is poured below this.